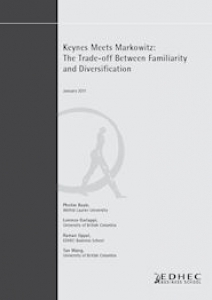 We develop a model of portfolio choice that nests the views of Keynes—who advocates concentration in a few familiar assets—and Markowitz—who advocates diversication across assets. We rely on the concepts of ambiguity and ambiguity aversion to formalize the idea of an investor's "familiarity" toward assets. The model shows that when an investor is equally ambiguous about all assets, then the optimal portfolio corresponds to Markowitz's fully-diversied portfolio. In contrast, when an investor exhibits different degrees of familiarity across assets, the optimal portfolio depends on (i) the relative degree of ambiguity across assets, and (ii) the standard deviation of the estimate of expected return on each asset. If the standard deviation of the expected return estimate and the difference between the ambiguity about familiar and unfamiliar assets are low, then the optimal portfolio is composed of a mix of both familiar and unfamiliar assets; moreover, an increase in correlation between assets causes an investor to increase concentration in the assets with which they are familiar (flight to familiarity). Alternatively, if the standard deviation of the expected return estimate and the difference in the ambiguity of familiar and unfamiliar assets are high, then the optimal portfolio contains only the familiar asset(s) as Keynes would have advocated. In the extreme case in which the ambiguity about all assets and the standard deviation of the estimated mean are high, then no risky asset is held (non-participation). The model also has empirically testable implications for comparative statics with respect to idiosyncratic and systematic risk: in response to a change in idiosyncratic risk, the Keynesian portfolio always exhibits a bigger change than the Markowitz portfolio, while the opposite is true for a change in systematic risk.